Analytical chemistry is the branch of chemistry that deals with determining the identity and concentration of chemical substances (analytes). G. E. F. Lundell, an American chemist at the National Institute of Standards and Technology likened the questions that analytical chemists answer to the following one: What is the average mass of trout in this stream? To answer this question scientifically, one must devise a way to sample the population of trout in the stream in a representative way, perform the sampling (fishing), get rid of interfering species (e.g., bass, perch, walleye), weigh each trout, record the data, and calculate the average. A chemist measures concentrations in a urine sample. concentration of manganese in a steel sample, for example. Molecular analysis involves the identification and determination of molecules. Analytical chemists are employed to assure that the caffeine concentration in soda is within the limits set by the U.S. Food and Drug Administration (FDA). Recently analytical chemists have worked with biologists to measure concentrations in biological systems. Currently research analytical chemists are working to devise techniques to determine the identity and concentration of all of the proteins in a cell. Most analyses involve tasks similar to the above trout measurement. Chemists must reproducibly sample a population, remove interfering species, determine the concentration and record the results. Analytical chemists use a variety of chemical and physical methods to determine identity and concentration. Purely chemical methods were developed in the nineteenth century and therefore are called classical methods. Physical methods involve determinations based on the amount of light absorbed or emitted by the analyte or on the strength of an electrical signal created by the analyte at an electrode. Classical methods or quantitative analyses include gravimetry, where the amount of a substance is determined by the mass of product generated by a chemical reaction, and titrimetry, where concentration is determined by the volume of a reagent needed to completely react with the analyte. These methods are highly accurate and precise but require a sufficient amount of sample, and a concentration of analyte in the sample of at least 0.1 percent. Furthermore these analyses require the constant attention of a trained scientist. Physical or instrumental methods were extensively developed in the twentieth century and are gradually replacing classical methods. In Principles of Instrumental Analysis , three American chemists, Douglas Skoog, F. James Holler, and Timothy Nieman, detail many instrumental methods that use highly complex and often costly machines to determine the identity and concentration of analytes. While these methods often are not as accurate and precise as classical methods, they require much less sample and can determine concentrations much less than 0.1 percent. In fact, Richard Mathies, professor at the University of California at Berkeley, and coworkers recently described methods that can determine the presence of one molecule! In addition, instrumental methods often produce results more rapidly than chemical methods and are the methods of choice when a very large number of samples of the same kind have to be analyzed repetitiously, as in blood analyses. Analytical chemistry began in the late eighteenth century with the work of French chemist Antoine-Laurent Lavoisier and others; the discipline was further developed in the nineteenth century by Carl Fresenius and Karl Friedrich Mohr. 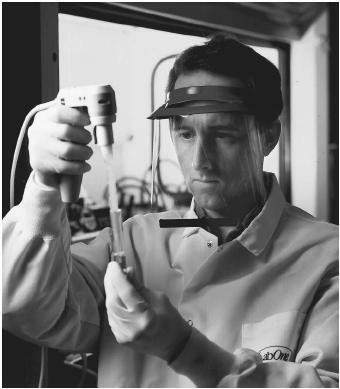 As a pharmacist's apprentice in Frankfurt, Germany, Fresenius developed an extensive qualitative analysis scheme that, when it was later published, served as the first textbook of analytical chemistry. He built a laboratory at his house that opened in 1848. Here he trained students in gravimetric techniques that he had developed. Mohr developed laboratory devices such as the pinch clamp burette and the volumetric pipette. He also devised a colorimetric endpoint for silver titrations. It was his 1855 book on titrimetry, Lehrbuch der Chemisch-Analytischen Titromethode , that generated widespread interest in the technique. Most modern analytical chemistry techniques are based on instrumental methods involving optical and electrical instruments. Elemental concentrations can be determined by measuring the amount of light absorbed or emitted by gas-phase atoms. Similarly, molecular concentrations are correlated with the emission or absorption of light by molecules in aqueous solutions . Electrodes, like the glass pH electrode, measure the electrical potential due to the presence of specific ions in solution. Finally, chromatographic methods separate the components of complex mixtures to determine the concentration of each component. One application of instrumental methods is the determination of what drugs a person has taken twenty-four hours after the person took them. In a procedure detailed by Thomas P. Moyer at the Mayo Clinic, a 5-milliliter (0.17-ounce) sample of the patient's blood is analyzed by a technique called high performance liquid chromatography. The sample is treated and injected into a stream of water and methanol that is called a mobile phase. The mobile phase is pumped through a column of fine sand, where the particles of sand have been coated with a thin layer of an oil-like substance (octadecane). The molecules from the blood sample, including the drug, will spend part of their time adsorbed to the modified sand (stationary phase) and part of their time in the mobile phase. The molecules that spend the majority of their time in the mobile phase will it make through the column first. To determine when the molecules have exited the column, an ultraviolet (UV) light is placed so that it is perpendicular to the flowing stream of mobile phase. The molecules in the blood sample will absorb the UV light and create a signal at the detector. The height of the signal will be proportional to the concentration of the drug in the urine. The time between the sample injection and passage through the column is reproducible and, by comparing it to the time observed when standard samples are used, permits component identification. Research is under way to develop techniques that can determine the presence of one atom or molecule in solution, to reduce the size of the instrumentation required, and to analyze the contents of a single cell. These new techniques hopefully will enable the early detection of disease, the remote sensing of a chemical spill, or the rapid analysis of water and air on space vehicles. SEE ALSO Lavoisier, Antoine ; Measurement ; Solution Chemistry . Harris, Daniel C. (2003). Quantitative Chemical Analysis , 6th edition. New York: W. H. Freeman. Skoog, Douglas A.; Holler, F. James; and Nieman, Timothy A. (1998). Principles of Instrumental Analysis , 5th edition. Orlando, FL: Harcourt Brace College Publishers.